October 28 is Plush Animal Lover’s Day – and the objective of this day is simple – to give a little extra love and attention to your plush animals. Don’t have a plushie? We’ve got you covered! 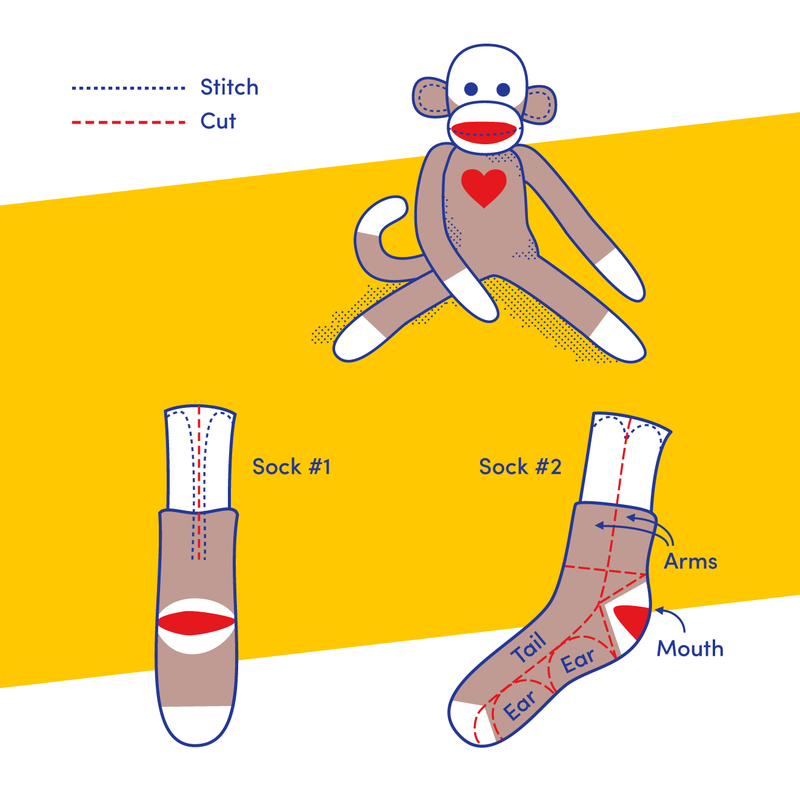 There’s no better time than now to get crafty and create your very own sock monkey. This iconic toy is easy to make and is even easier to love. Refer to diagrams labeled “Sock 1″ and “Sock 2″ for visual reference. Turn sock inside out and sew a seam 1/2″ on both sides of the center of the sock. Cut sock between the seams to within 1-1/2 inches of the white heel. Turn sock so that the seams are inside and use the crotch opening to stuff head, body, and legs. Sew shut. Tail: Cut 1″ strip the entire length of the front of the sock. Seam and stuff. Mouth: Cut the heel from the sock – leaving a brown edge around the white. Fasten onto the lower part of the face, using a whip stitch across the bottom. Stuff and finish sewing around the top. Arms: Cut the remaining upper part of the sock into two pieces. Seam (rounding the ends), and stuff. Ears: Cut the ears from the sole of the sock. Eyes: The eyes can be made by either sewing on buttons or embroidering them with black thread. Attach finished pieces to the body!